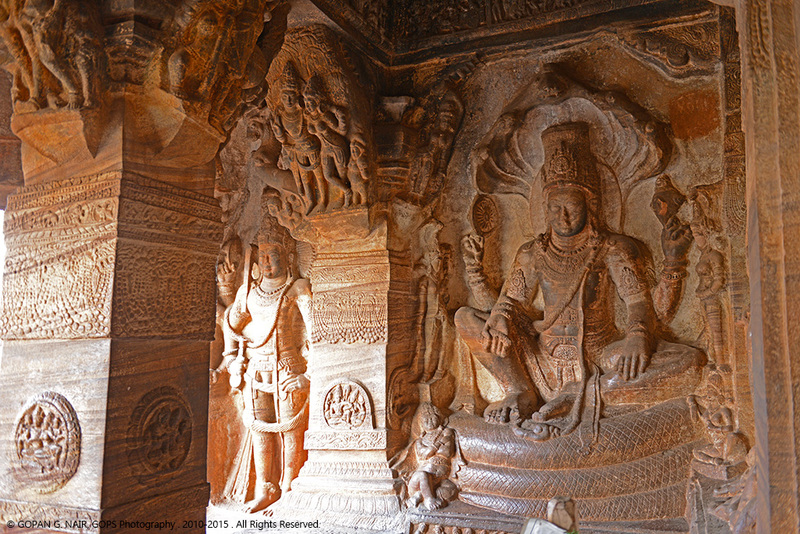 BADAMI (ಬದಾಮಿ or Vatapi as it was known originally) is an ancient temple town located in the Bangalkot district of Nothern Karnataka in India. 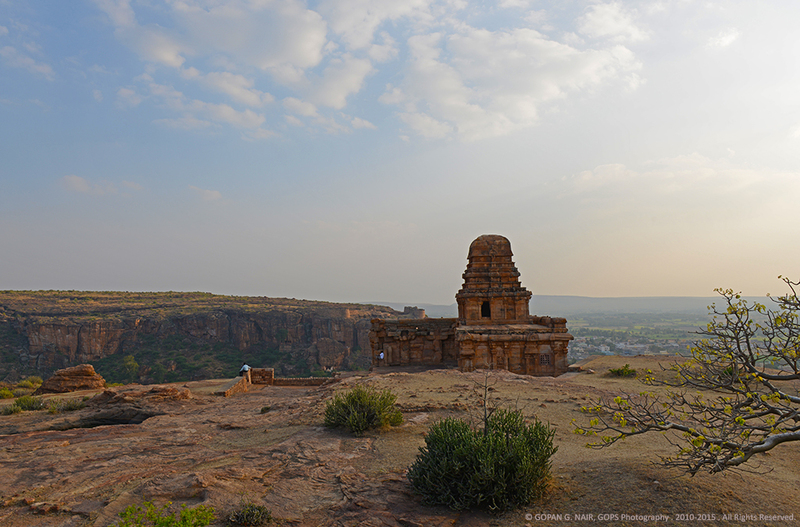 The place ‘Badiamaioi’ mentioned by Greek Geographer Ptolemy (150 AD) has been identified as Badami. 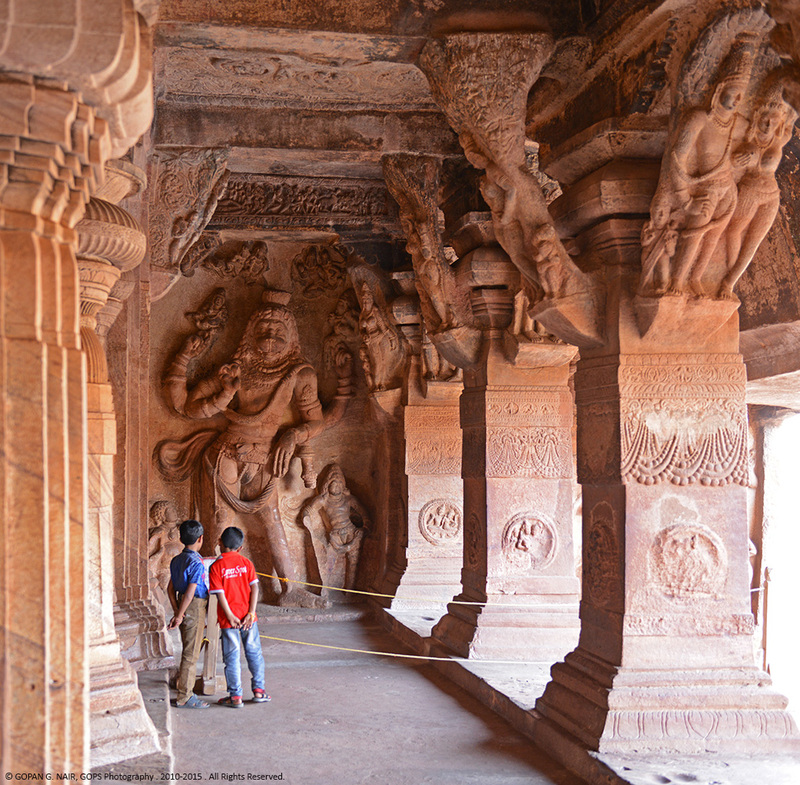 Badami was the capital of Chalukya dynasty who ruled several parts of Karnataka between 540 to 757 AD. 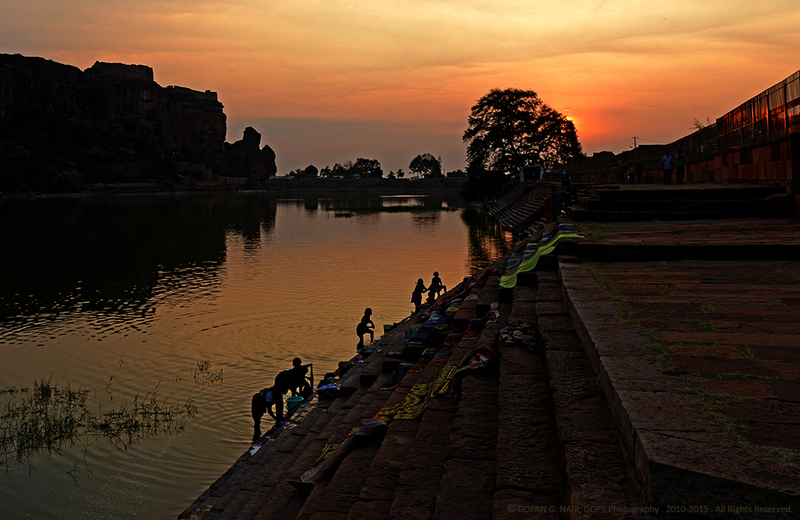 The town of Badami lies 460 Kms from Bangalore, situated at the mouth of a ravine protected by huge red sandstone ridges on either sides with a beautiful lake (Agastya lake) in the middle. 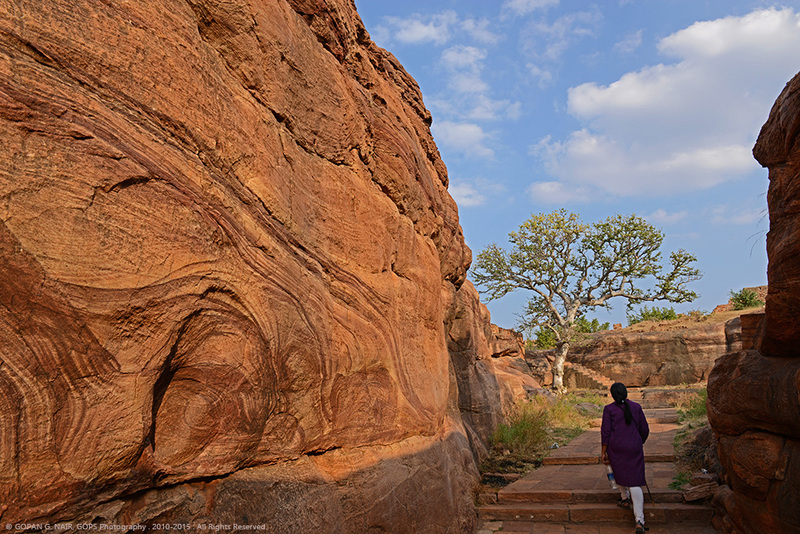 Legend has it that Badami was named after an asura called Vatapi who got killed by sage Agastya. 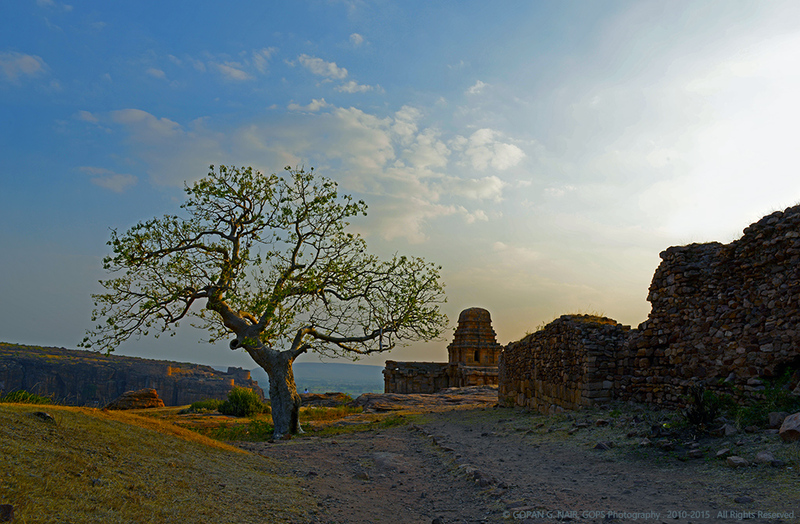 Chalukya rulers had fortified the hills surrounding the town and built several temples in and around the area. 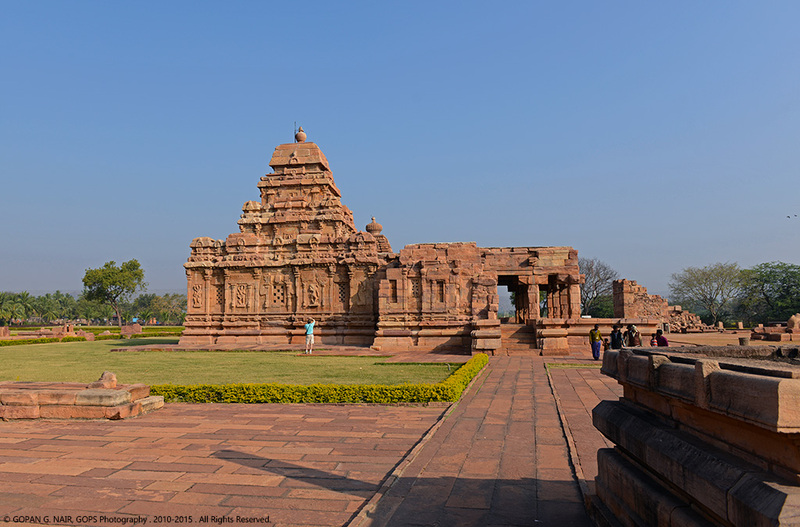 The temples and ruins at Badami, Pattadakkal, Aihole and Mahakuta are good examples of Chalukya architecture. 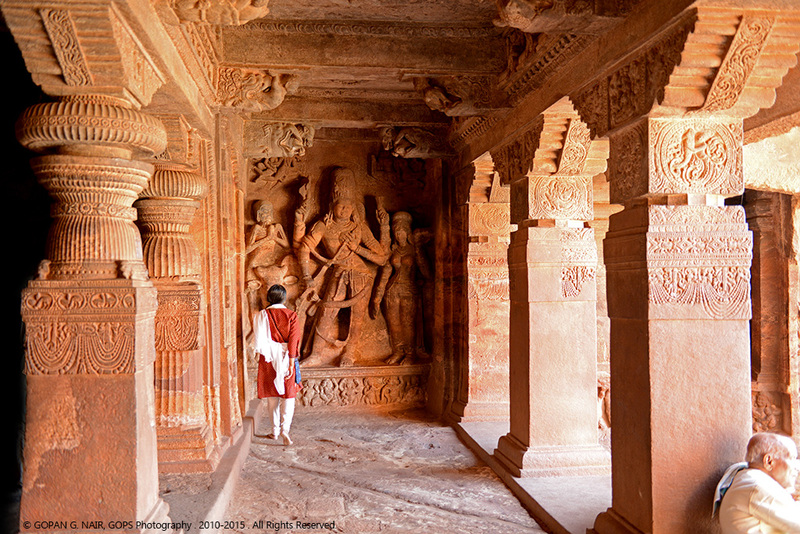 The most famous among this group of temples are the rock-cut cave temples built between 6th and 8th centuries AD. There is a famous Carnatic recital “Vatapi Ganapatim Bhaje” praising lord Ganesha at Vatapi, composed by Muthuswami Dikshitar. The Chalukyas were defeated by Pallavas in 7th century and the idol of Vatapi Ganapati was transferred to TamilNadu which is now at Uthrapathiswaraswamy Temple, near Thanjavur. 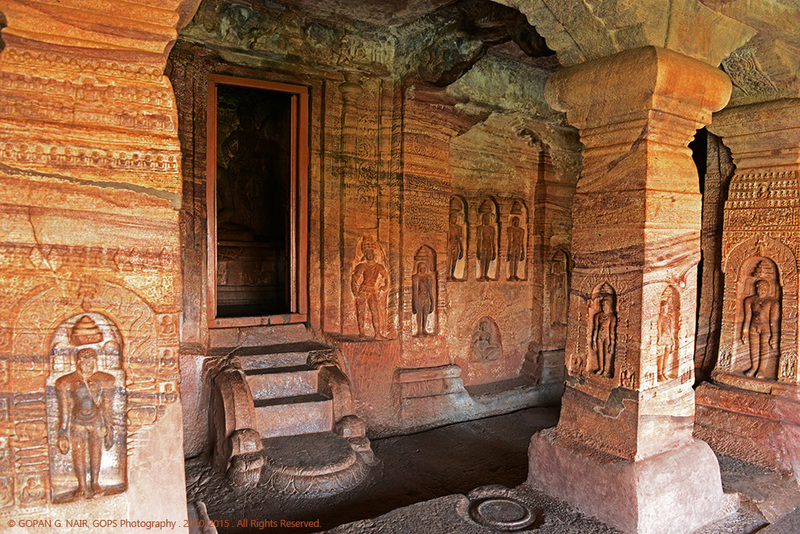 Badami Cave Temples were built by King Pulikeshi-I during 600 to 700 AD . 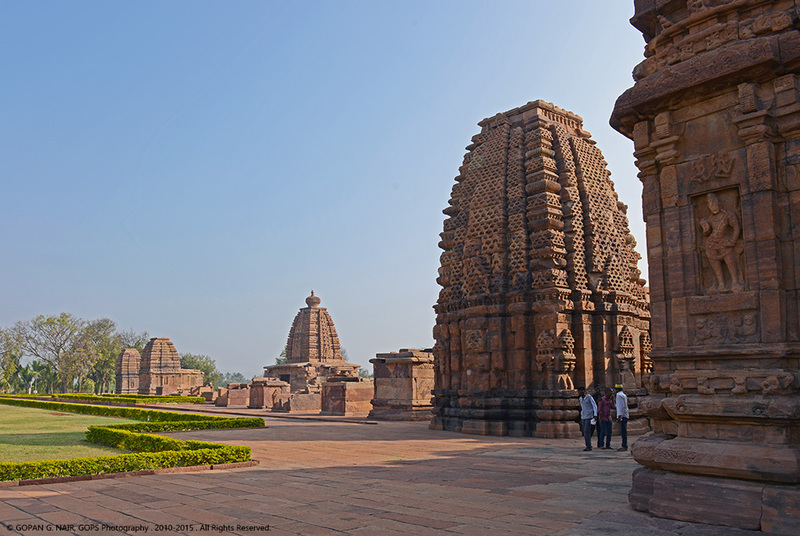 The architecture of these temples follow a blend of North Indian Nagara style as well as South Indian Dravidian style. 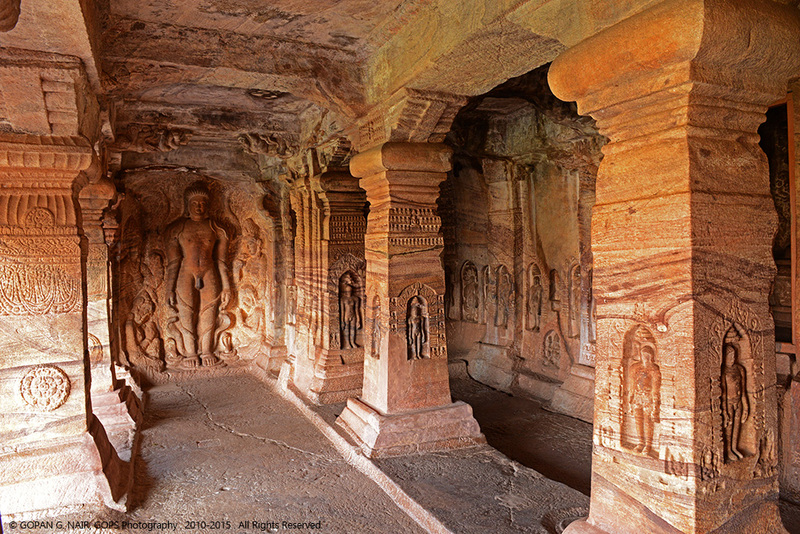 There are 4 caves in total, where Shaivism, Vaishnavism & Jainism were being practiced side by side. This is a fine example of religious tolerance of Chalukya rulers. 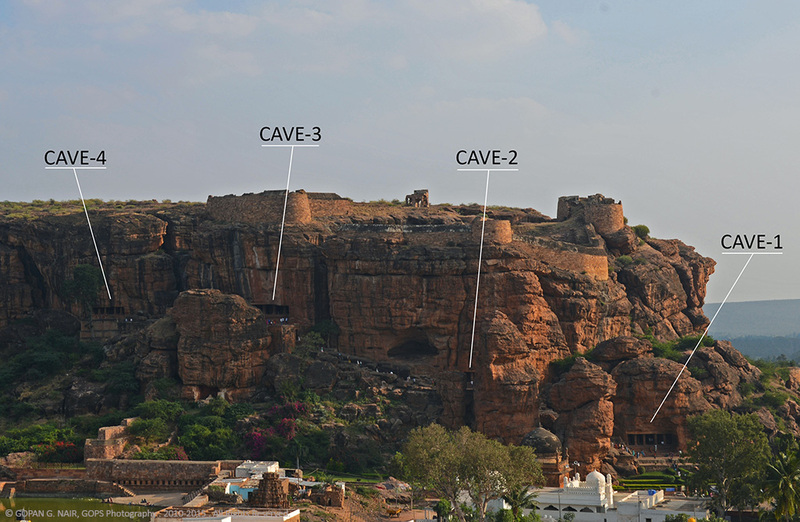 Cave-1 is dedicated to Lord Shiva, Caves-2&3 to worship Lord Vishnu and Cave-4 was a Jain shrine. 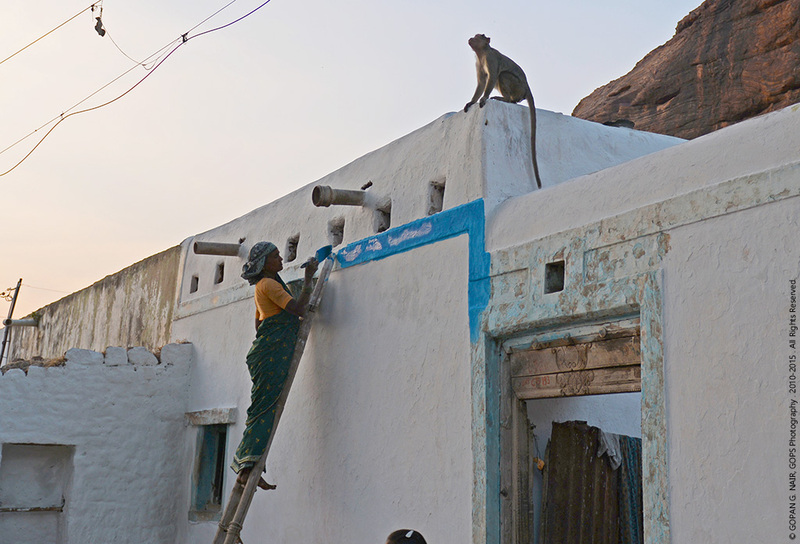 Beware of monkey thieves ! Avoid carrying bags and food items. Those monkeys are experts in snatching your stuff. 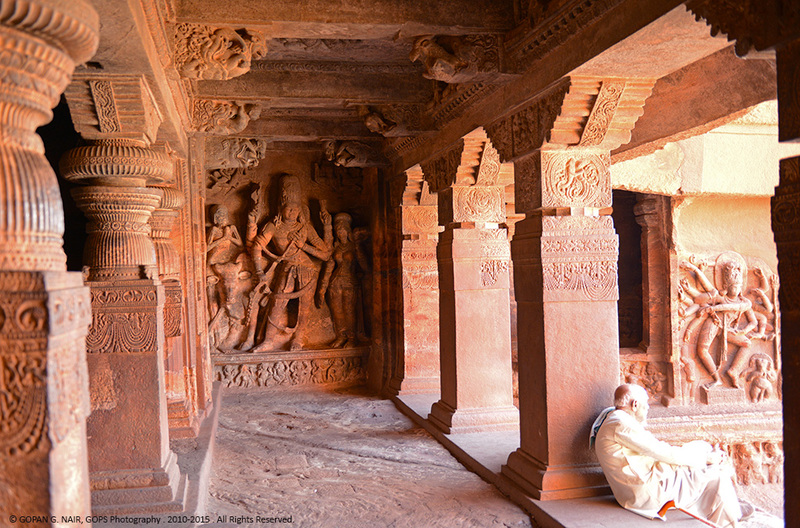 Cave-1 is the oldest of them all, carved out of red sandstone in 578 AD . Climb up a flight of steps that leads you to a rectangular sanctum with a number of pillars and fine carvings of Lord Shiva and Parvati in various poses. The walls, pillars & ceiling are highly ornamental and also decorated with murals. 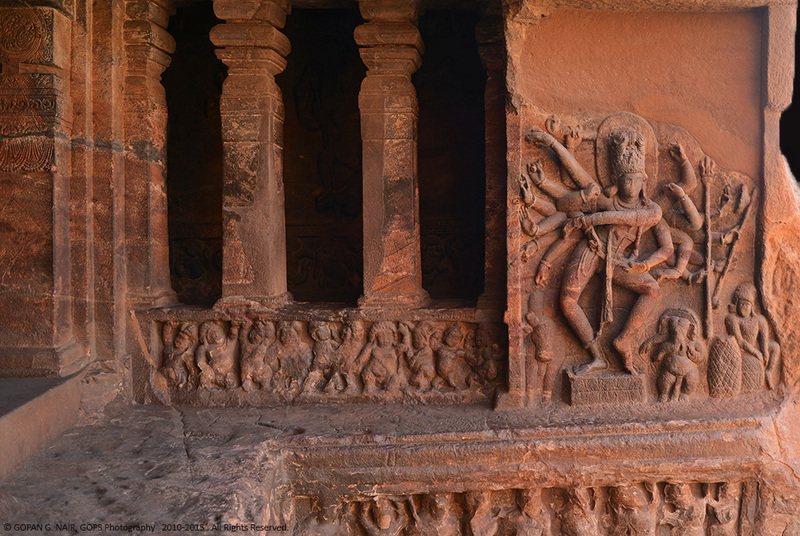 The major attraction of the cave is the statue of Shiva in the form of 18 armed Nataraja, known as ‘Lord of Dance’. It has been made in such a way that each combination of a pair of hands represents a mudra of Bharatanatyam dance (a form of Indian classical dance) . 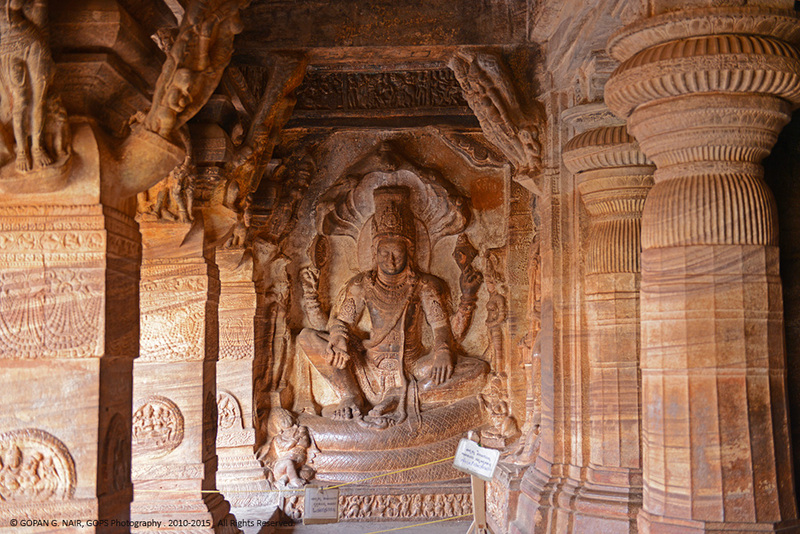 A total of 81 such mudras have been depicted in this amazing sculpture. 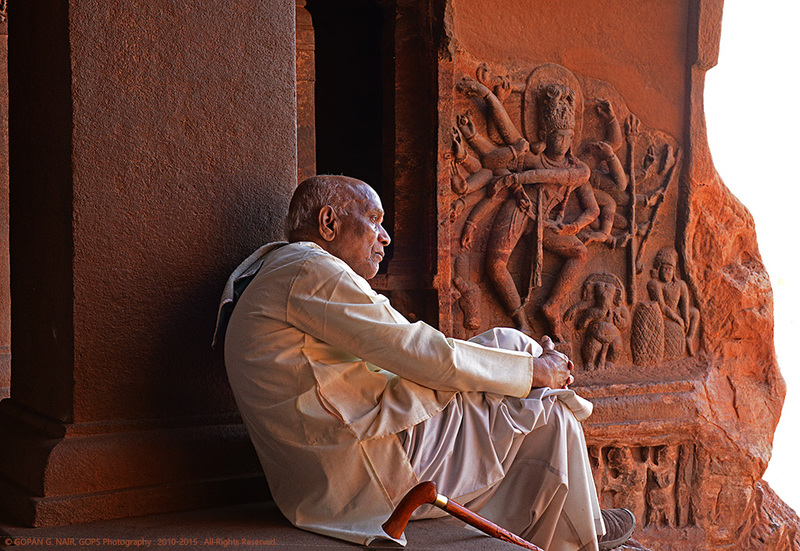 Shiva’s son Ganesh could be found watching the dance or trying to imitate his father. Nandi the bull also stands next to Nataraj in the sculpture. 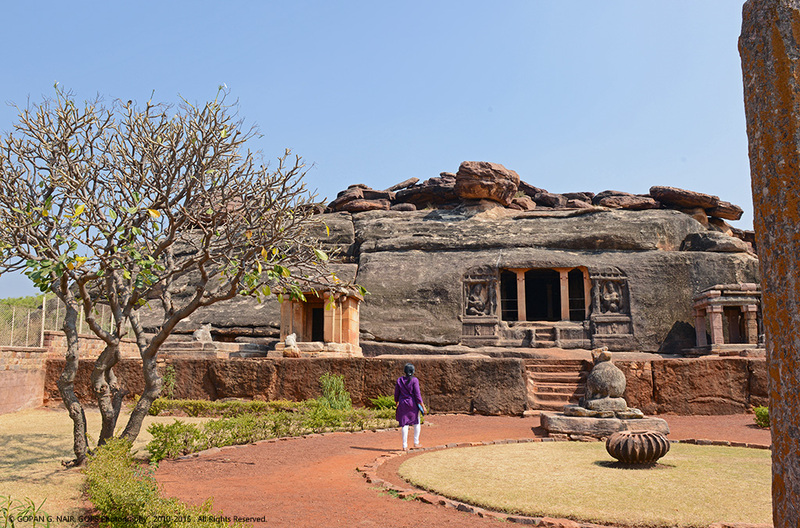 Adjacent to the Nataraja statue is another grand sculpture of goddess Mahishasuramardini .The cave also portrays an idol of Shiva with Lakshmi and Parvathi standing on either sides. 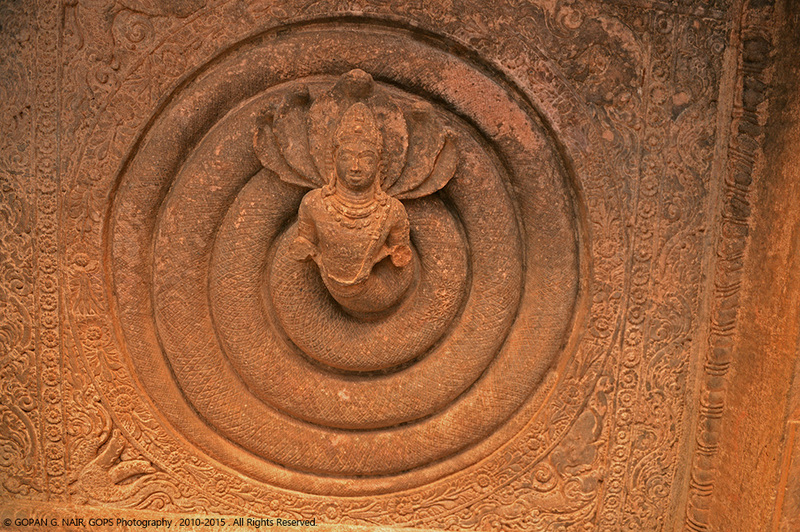 The ceiling of the cave is decorated with a Nagaraja motif, the serpent king. Cave-2, built in the 6th century AD is similar in size & construction to Cave-1. It is dedicated to Lord Vishnu in the form of Trivikrama who stands with one foot on Earth and the other pointed towards North. 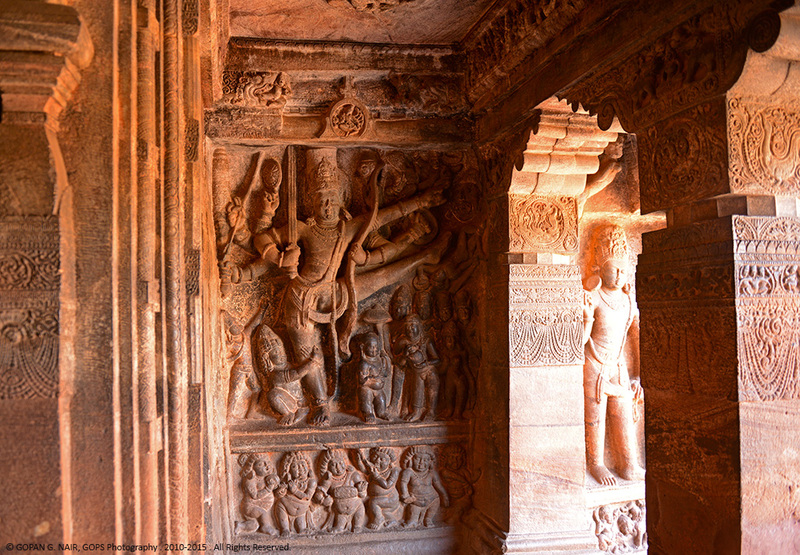 Vishnu has also been depicted in the avatars of Krishna and Varaha in this temple. 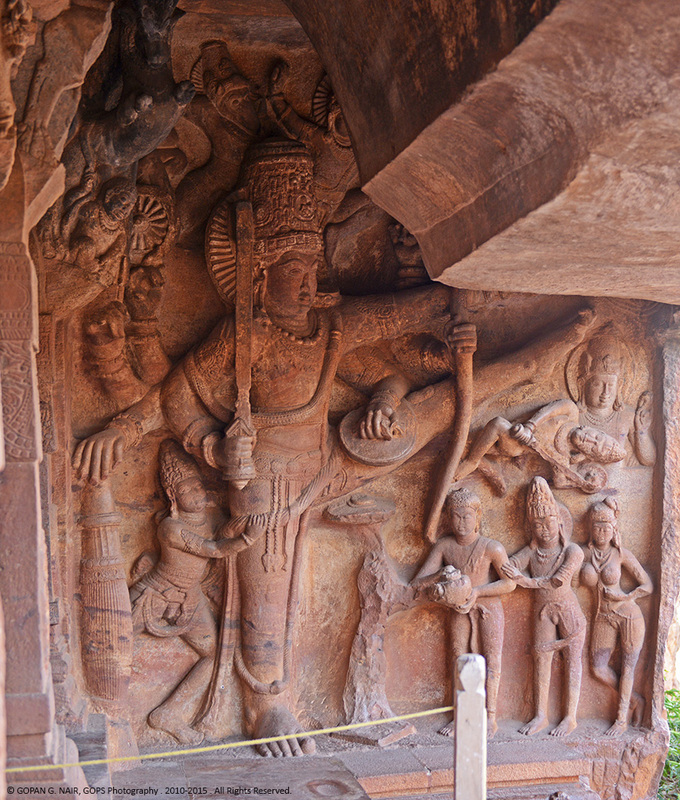 The Dwarapalaka or armed guard can be found at the entrance, holding a flower . The ceiling has been decorated with an art-work of a wheel with sixteen fish spokes and another one with swastikas built inside square frames. ROCK-CUT STEPS BETWEEN THE CAVES. Cave-3 is the biggest among all, constructed in 578 AD. This shrine is dedicated to Lord Vishnu in his various avatars. 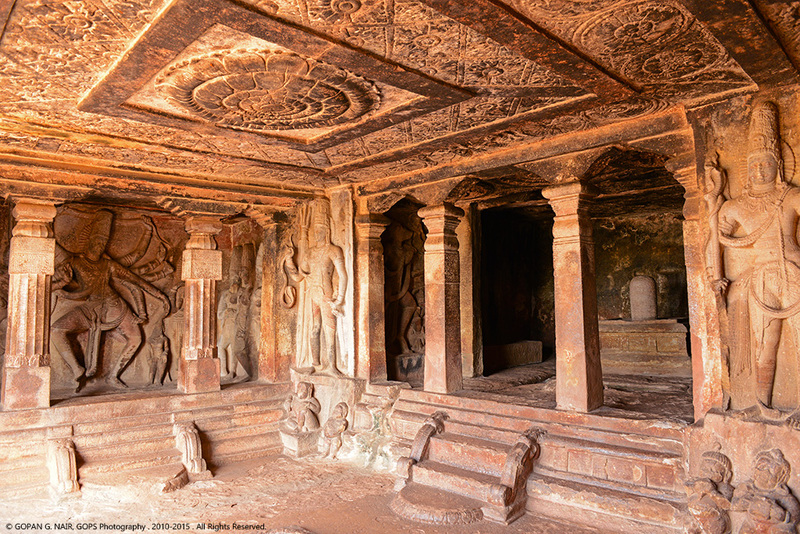 The cave has exquisitely carved interiors with a large number of Vishnu’s reliefs like standing Vishnu, Vishnu holding serpent, avatars like Narasimha, Varaha, Harihara and Trivikrama. The ceiling has been decorated with mural paintings of Lord Brahma with a lotus medallion engraved on the floor beneath it. 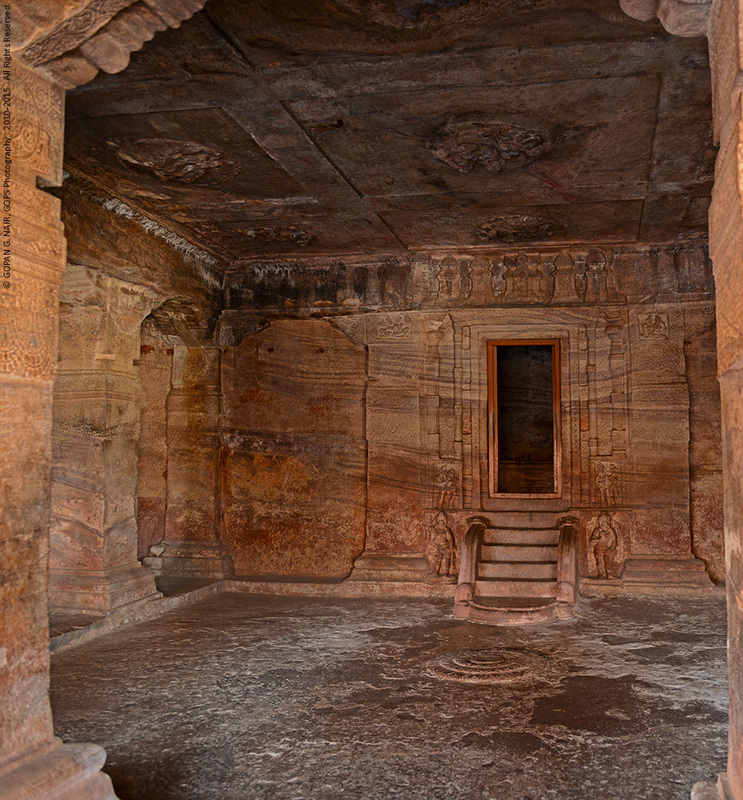 Cave-4 is a Jain shrine built later in 6th or 7th century. 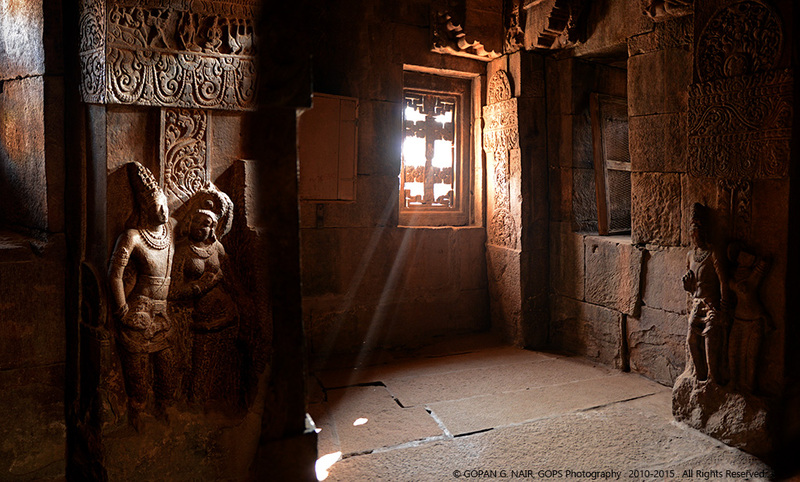 It contains incredibly beautiful carvings of Bahubali (Mahavir) and several Tirthankaras of Jain religion adorning the sanctum. 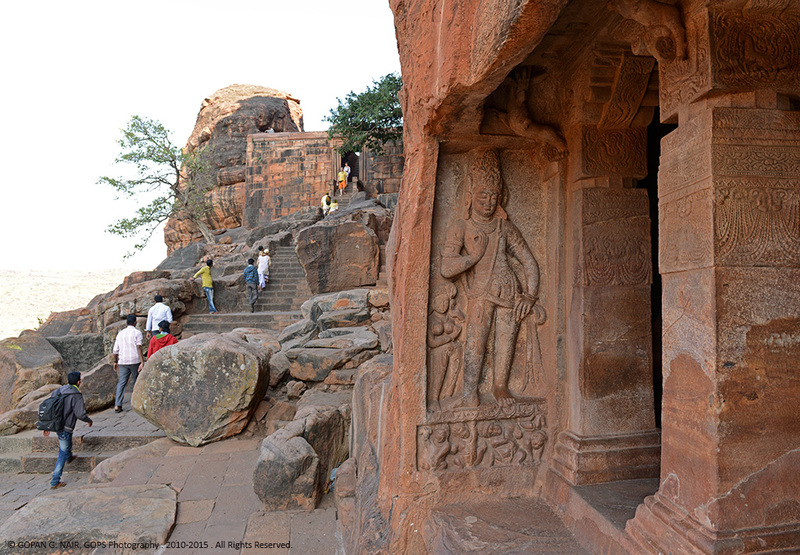 Badami Fort is spread across two hills, most of which got ruined as the result of wars between Chalukyas & Pallavas. The Chalukya King Pulakeshi I constructed the fort during his reign between 543-566 AD and made it the capital of Chalukya empire. Rock-cut steps leading to the top of the hill start at the archaeological museum. It is a steep climb and a bit strenuous too. Carry enough water with you and keep a watch for monkey menace. The fort encloses large granaries and two temples viz. 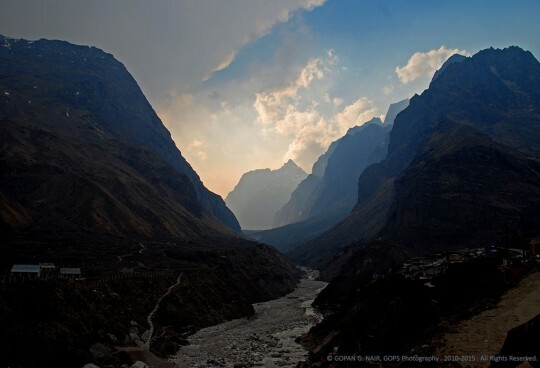 the Lower Shivalaya dedicated to Ganesh and the Shiva Shrine Malegitti Shivalaya at a much higher altitude. It is believed that the lower Shivalaya temple is where the Vatapi Ganapathi idol was originally placed. 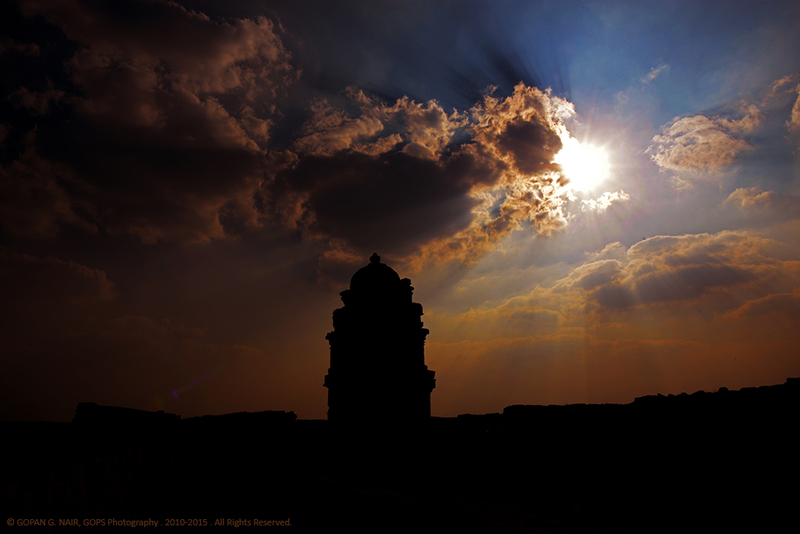 The fort also houses treasuries and a Cannon placed there by Tipu Sultan later during 17th century . THE LOWER SHIVALAYA DEDICATED TO LORD GANESHA. IT IS BELIEVED THAT VATAPI GANAPATHI IDOL WAS ORIGINALLY LOCATED HERE. CLIMBING UP THE HILL COULD BE TIRESOME . IT IS NICE TO SEE THE DIFFERENT ROCK TEXTURES ON YOUR WAY UP . 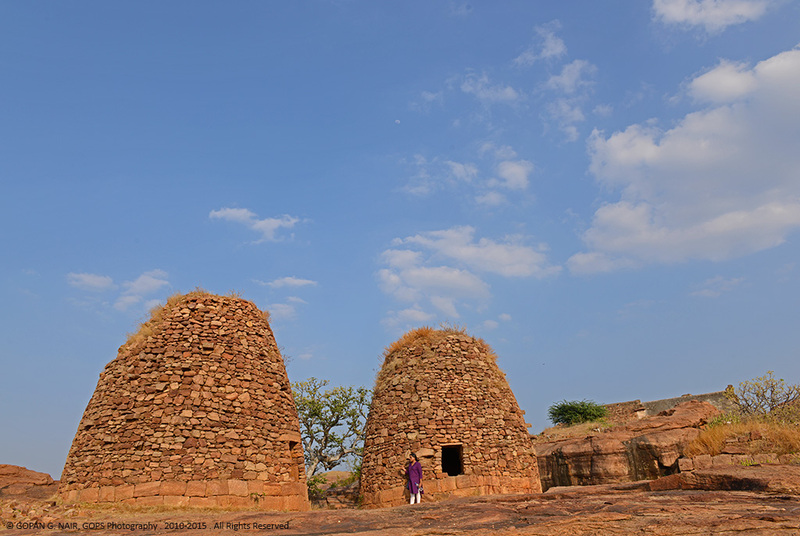 ANOTHER VIEW OF MALEGITTI SHIVALAYA AMID THE RUINS OF THE FORT. 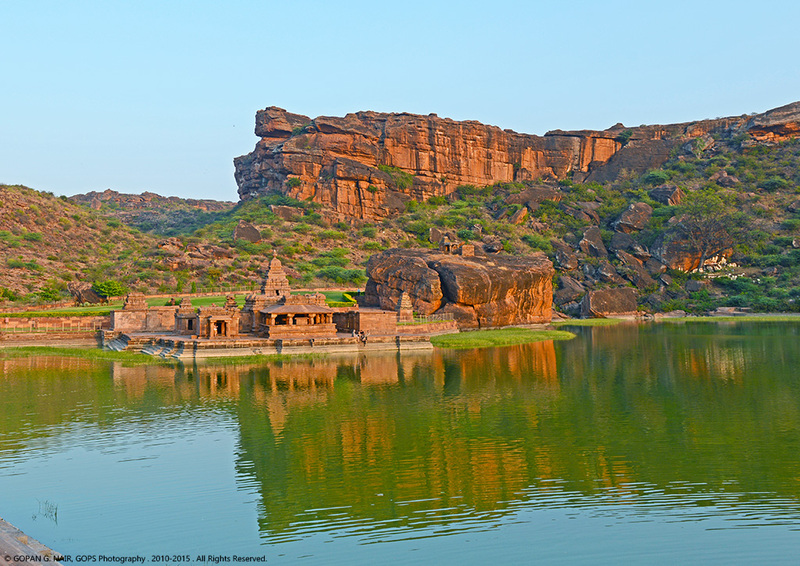 Other major attractions in Badami are the Bhutanatha temple & Mallikarjuna temples situated on the banks of a tank locally called the Agasthya Tirtha. 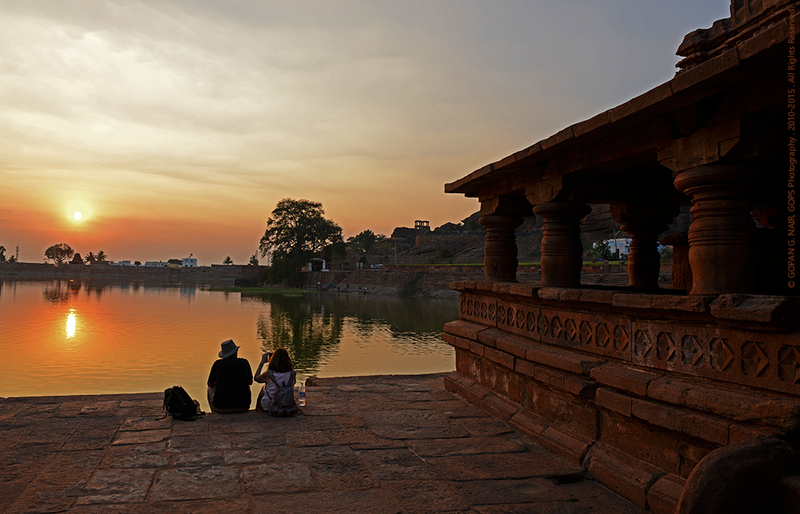 One should not miss the other sightseeing places like Pattadakal, Aihole and Mahakuta, scattered around Badami . 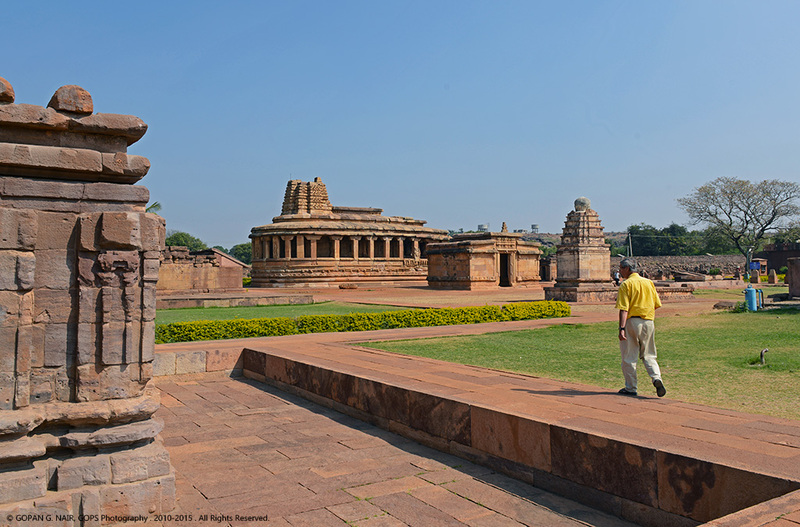 The historical village of Pattadakal lies at a distance of around 20 km from Badami . 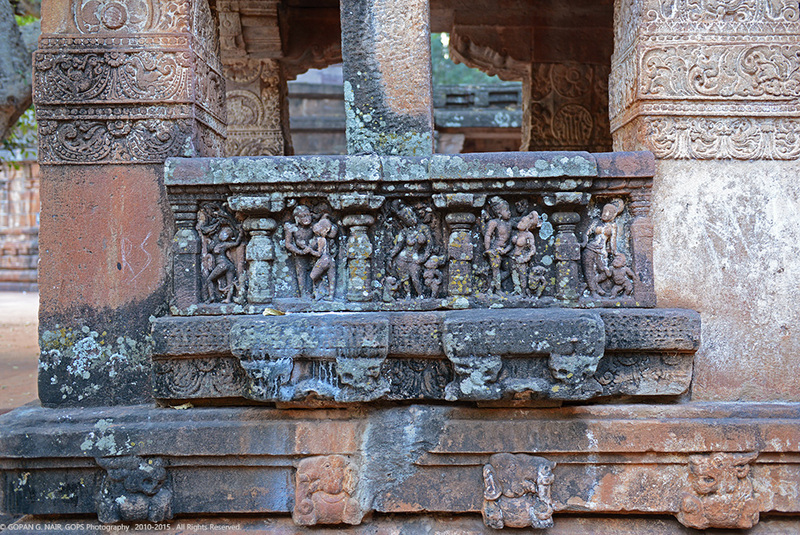 Aihole is another protected archaeological site situated 14 Kms from Pattadakal . These sites have several picturesque temples dating back to the 6th and 7th century AD. 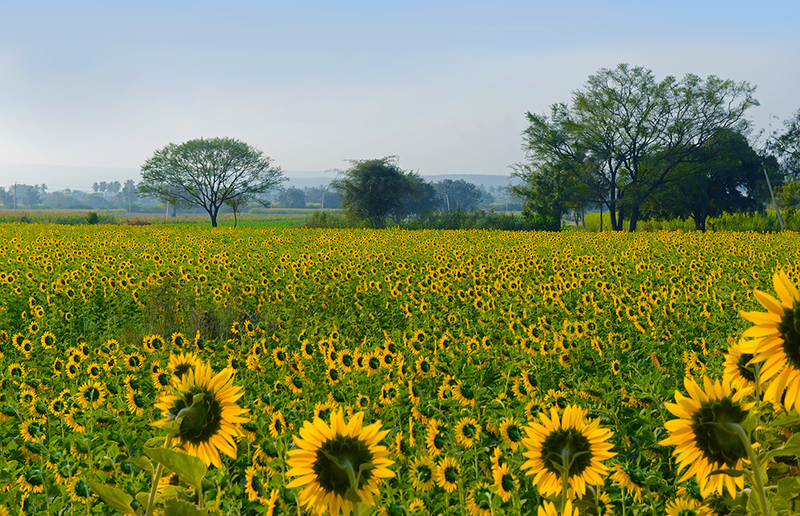 The drive through these village roads is really interesting as it passes through sunflower gardens & green farms. 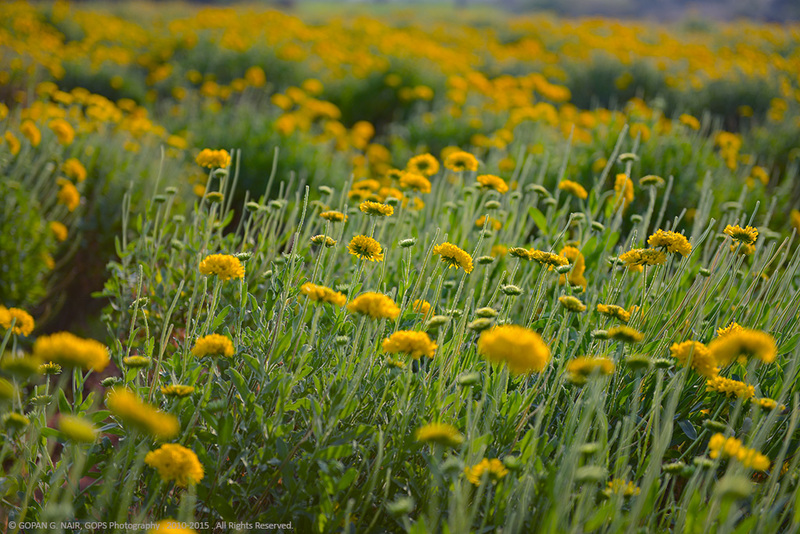 The flora and fauna around the country-side is incredibly beautiful. 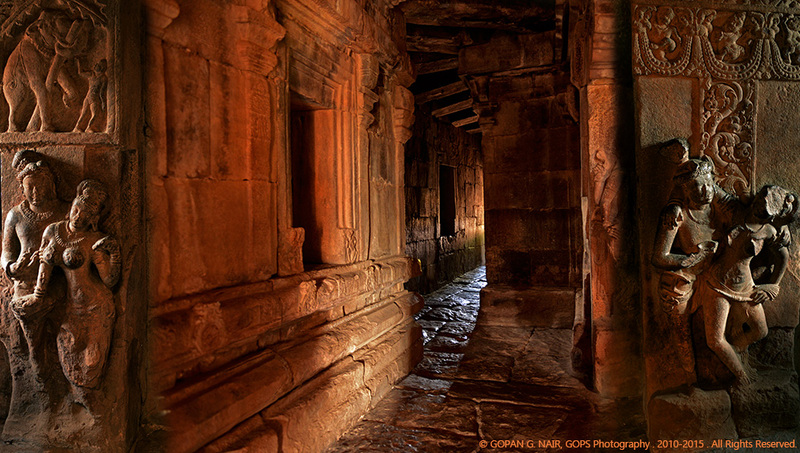 PATHWAY TO HISTORY : OVER 1300 YEARS OLD TEMPLES AT PATTADAKAL, KARNATAKA. 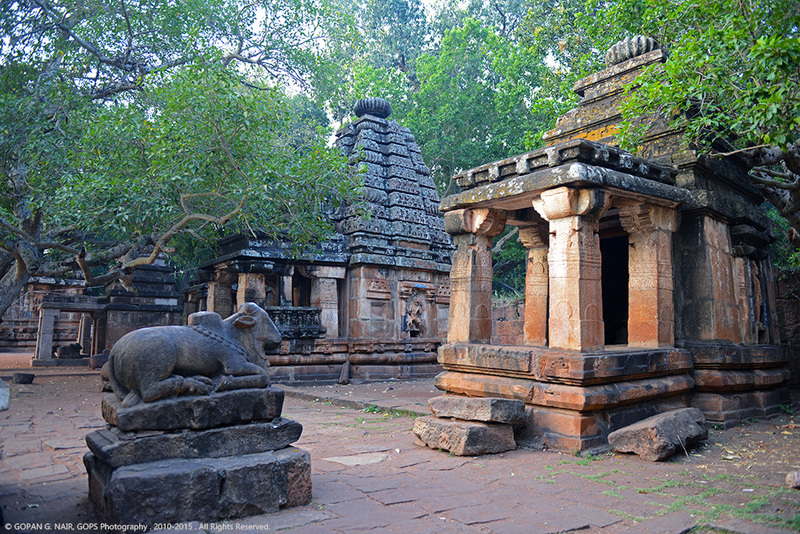 PATTADAKAL. 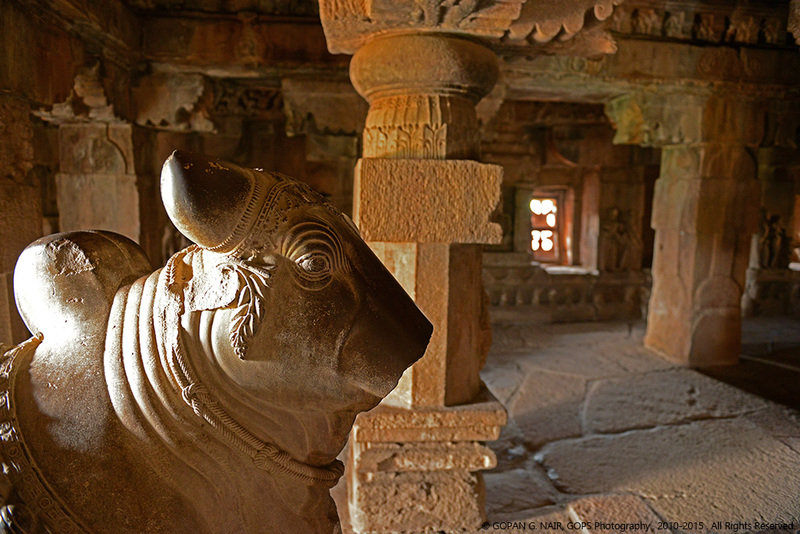 AN EXQUISITE CARVING OF NANDI THE BULL. PARTLY DAMAGED. LOOK AT THE FINE DETAILS OF THE ROPE !! 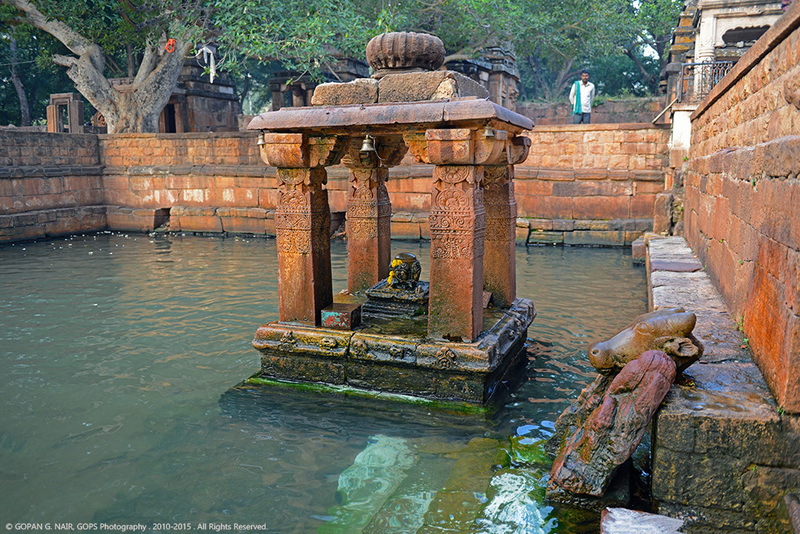 MAHAKUTESVARA TEMPLE AND THE VISHNU PUSHKARNI POND. PILGRIMS TAKING HOLY DIP. 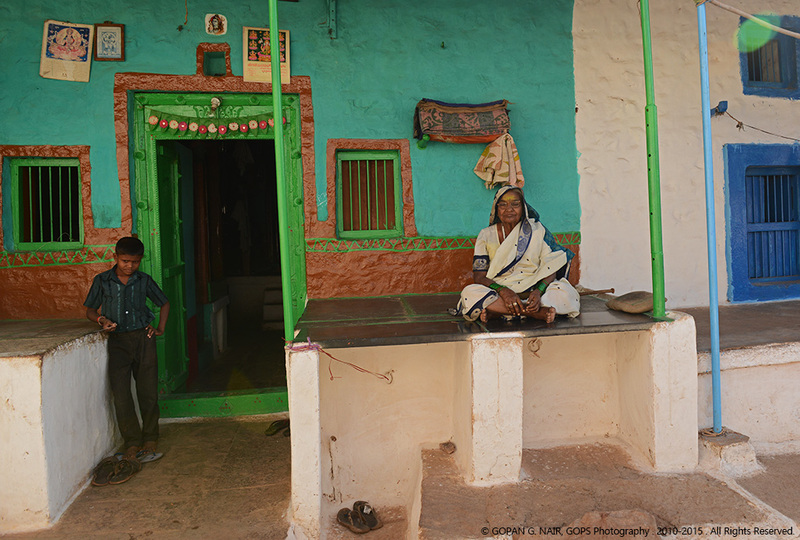 Mahakuta is another village that lies 14 Kms from Badami . There are several temples in Mahakuta temple complex, the most important ones are Mahakutesvara temple and the Mallikarjuna temple. 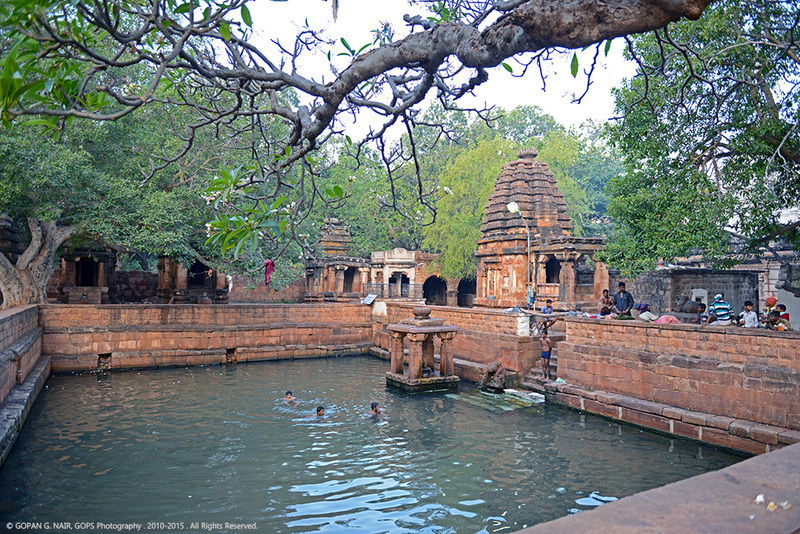 A large pond called Vishnu Pushkarni that gets filled by a natural spring is very important for the pilgrims visiting the complex. People believe it is auspicious to take a holy dip in this pond. 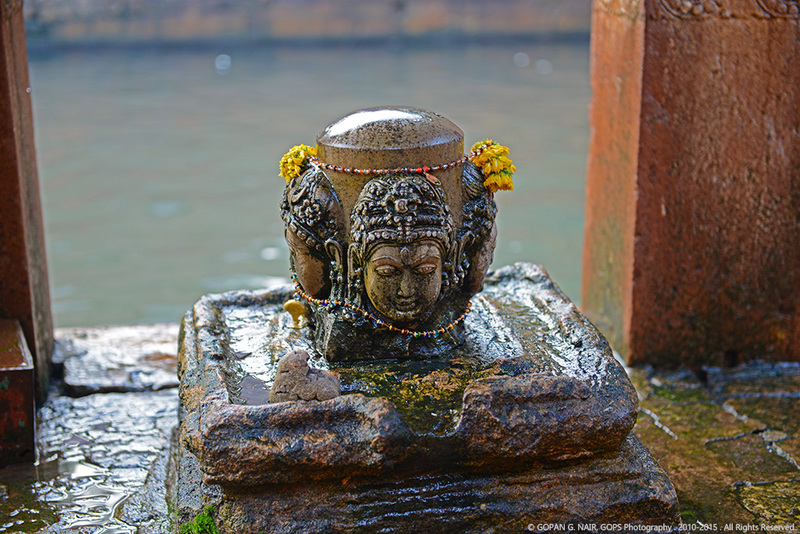 A small shrine situated in the middle of the tank has a special Shiva Linga (Panchamukha linga or five faced linga). 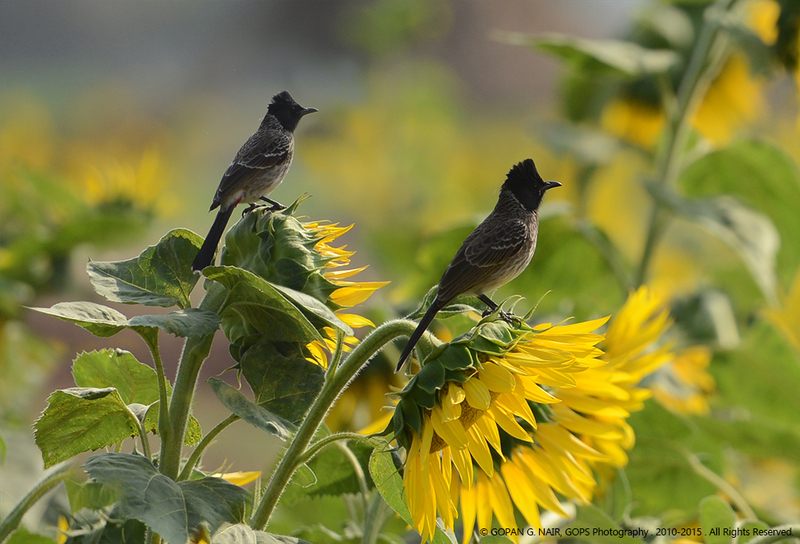 The temperature could shoot upto 45°C during summer . 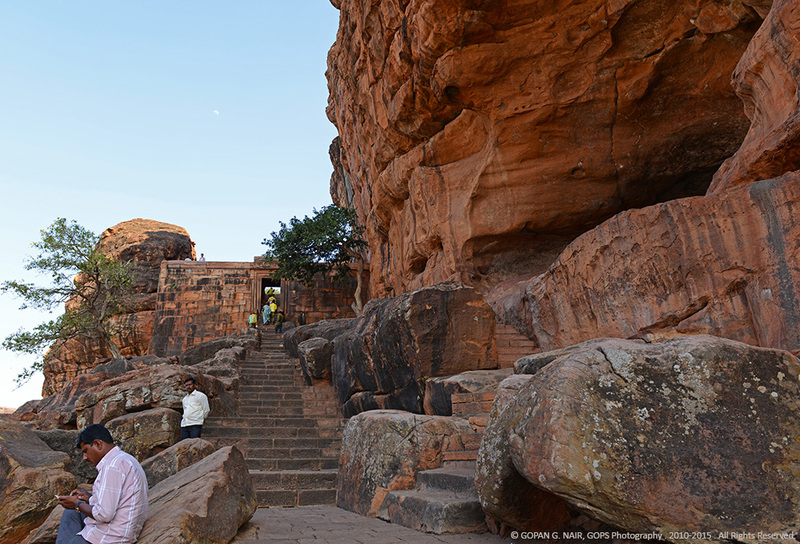 The best period to visit Badami would be October to February . Bangalore – Tumakuru – Chitradurga – Hosapete – Kushtagi – Badami : 454 Km. Bangalore – Bellary – Hosapete – Kushtagi – Badami : 513 Km. 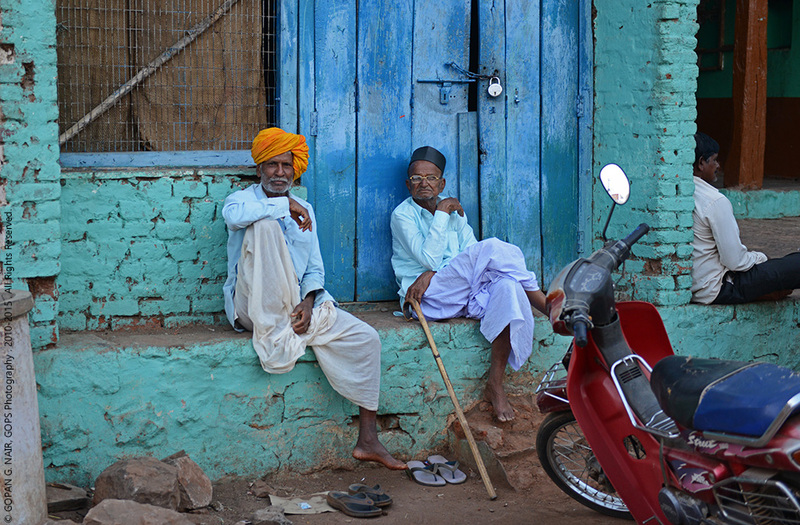 Pune – Satara – Kolhapur – Badami : 460 Km. 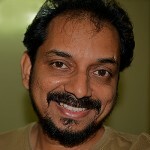 Pune – Solapur – Vijayapura – Bangalkote – Badami : 471 Km. Hyderabad – MahbubNagar – Raichur – Badami : 424 Km. 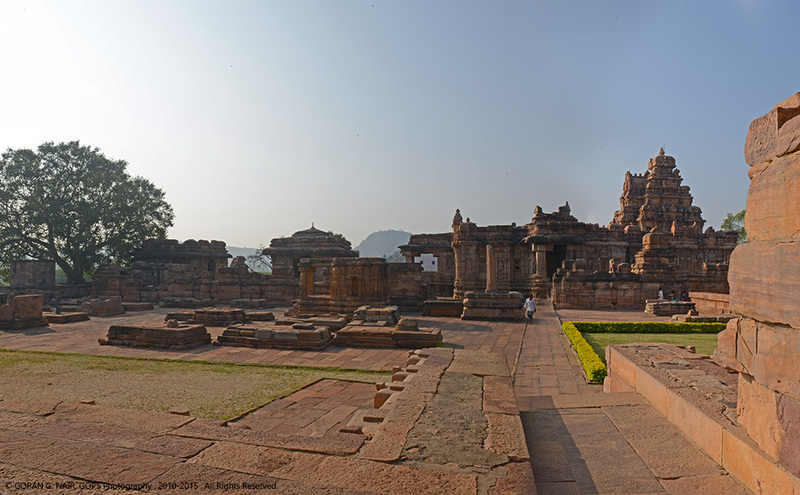 Hampi – Hosapete – Kushtagi – Badami : 150 Km. Badami – Pattadakal : 20 Km. 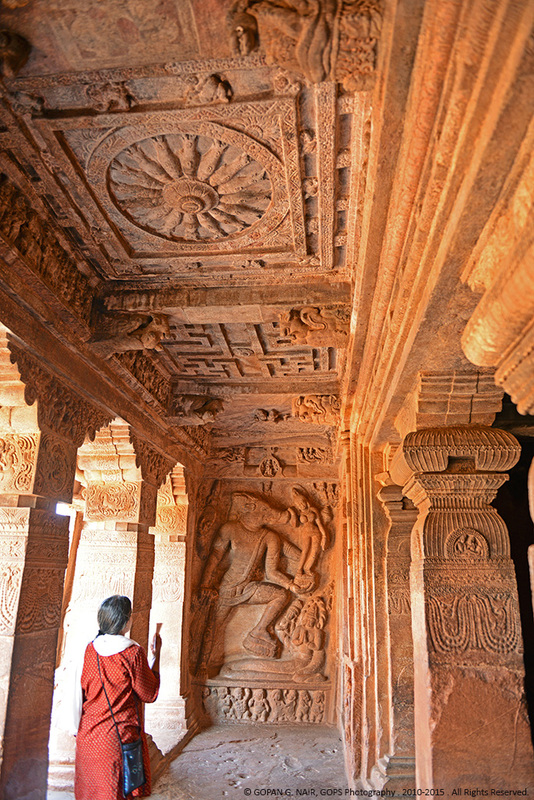 Badami – Aihole : 34 Km. 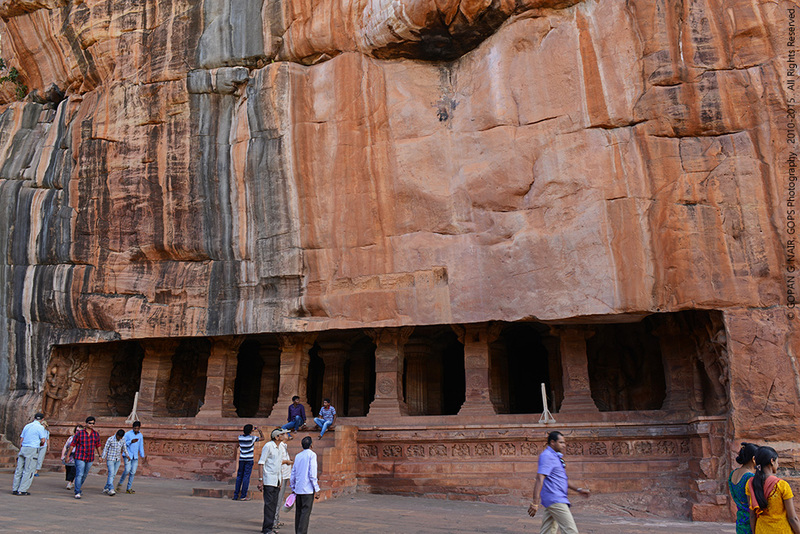 Badami – Mahakuta : 14 Km. Badami Railway Station has good connectivity with Bangalore, Hubli, Bijapur, Gadag, Solapur and other cities. This is perfect to the core. 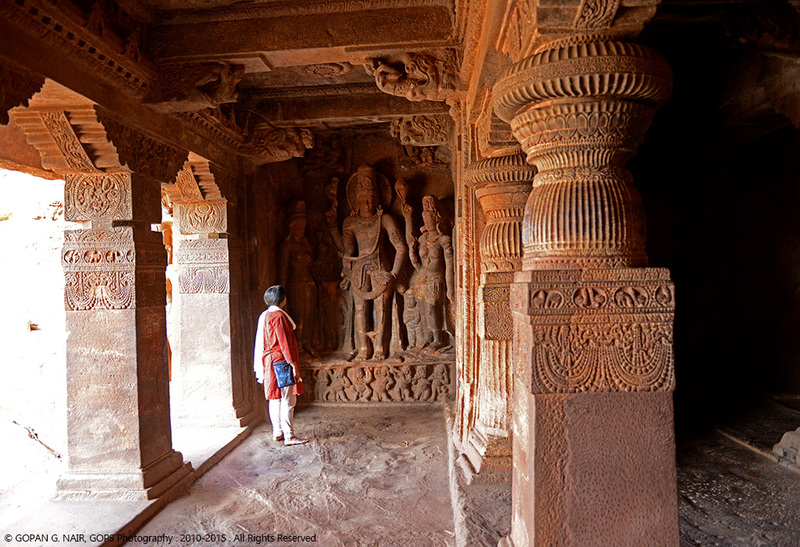 Those magnificent statues and reliefs take me to the 6th and 7th centuries in a time machine !!! Those wonderful stone marvels are so inviting that I have to plan again for my visit to this magical land !! Thanks for sharing !! Thank you very much for your usual support & guidance, dear Sir. Marvelous art work with amazing fine details on those sculptures…are well captured and presented. Thanks a lot for sharing this historical journey!! Thank you my friend. 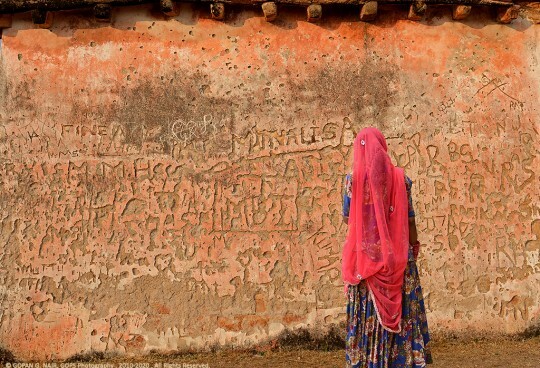 India is a treasure land. An exquisite piece of storeytelling both in pictures and in factshare . Humbled at the beauty and heritage that you’ve stretched out before us. By the way-the photostram look absolutely classy: which lens has been used ? Would like to know. Cheers, and thanks for this article. Thanks for your comments, Hari Madhavan. Appreciate it. Regarding the equipment used : I will be writing articles on photographic gear & techniques . Please wait for the same. Superb photographs with details. Art historians delight. Thank you for the treat. Thanks very much doctor, for your valuable comments. 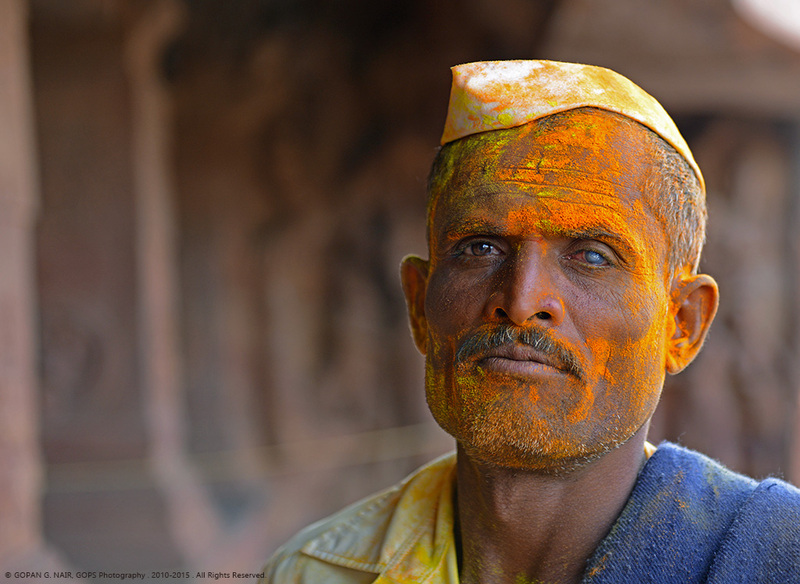 India is a land of unlimited possibilities. Let’s explore it together. Don’t forget to drop-in whenever you get some spare time. Such a wonderful write up !! It was indeed a treat to the eyes. Visited the place after going through your blog. Thanks & keep up the good work. Those were really encouraging words and thank you for the same. Please do check my pages frequently for more interesting articles. Very interesting write up and pictures. Great work. Keep it up. Thank you very much for your visit & comments. Appreciate it.